Not all Kitchen trends are equal. Every year there are new fads that gain popularity, only to fall off after a few months. If it’s a new flavour of ice cream that’s okay, but when it comes to a kitchen you don’t want to get it wrong. At BJF we have been doing it long enough to spot the difference between trend and fad, so we put together this list to help distinguish the trends from the fads. If you are going to spend your hard-earned money on a brand-new kitchen renovation you want it to last. 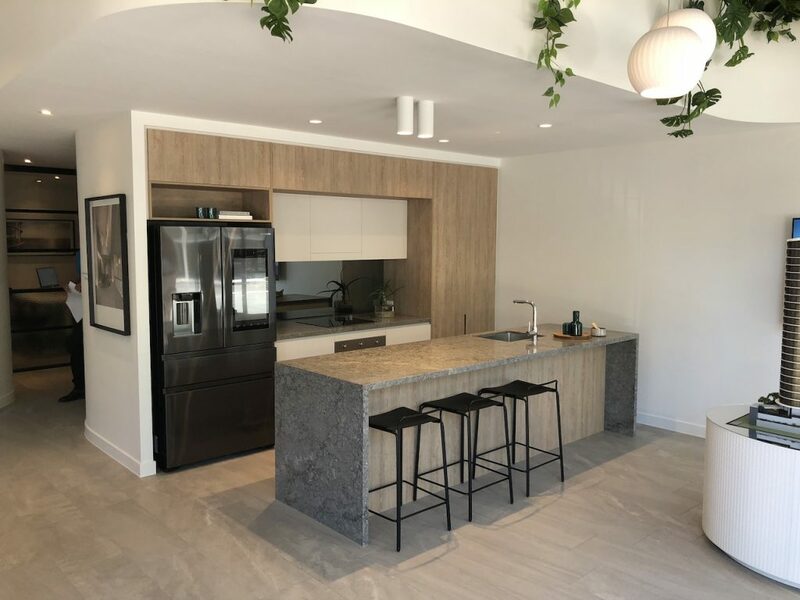 We have asked the industry and scrawled through the internet to find the biggest kitchen trends of 2019. We have narrowed down the list to what we think are the best trends of 2019. With the fervour of the new year ending as we settle into the middle months it’s the perfect time to get around to fixing up your kitchen. 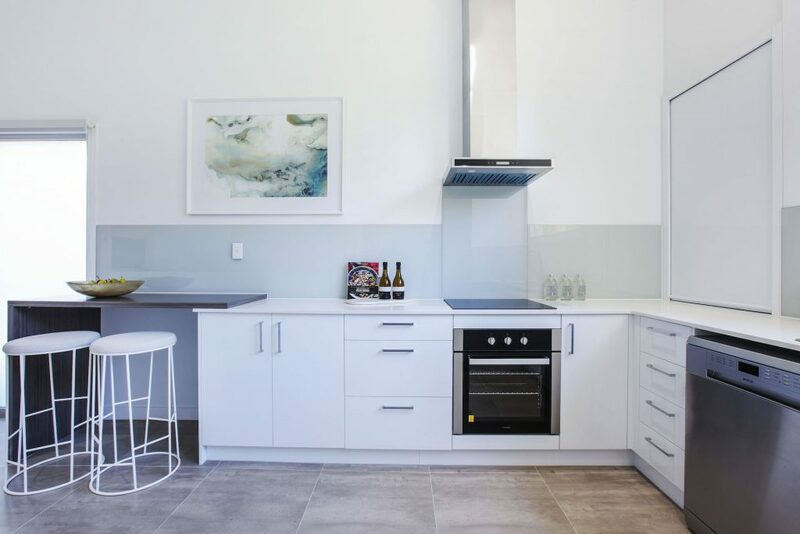 Have a look at these Kitchen trends and see if they could work for your new build. Our clients continue to gravitate towards concealed storage within their kitchen designs, with clever storage solutions. This style of concealed cabinetry can be adopted for any kitchen. By concealing storage, you are staying in line with a minimalist theme, allowing you to highlight specific sections of the kitchen. This Kitchen trend goes against the one above. 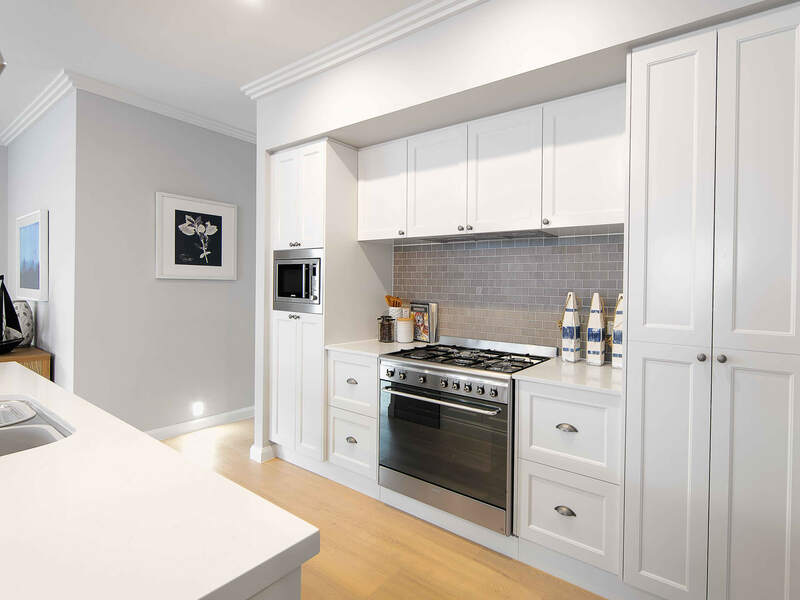 We have seen a rise in replacing kitchen upper cabinets with metal, wood or glass shelving. Inspired by the likes of hotel and retail spaces, this adds a bold place to feature prominent pieces within your kitchen, whether that be appliances, art, or other aesthetic pleasing objects. This goes against the grain of minimalism that is outlined in the above trend. Nevertheless, the less this is a growing trend that when pulled off properly can add a sense of character to your kitchen. People are increasingly seeking nature within their homes. In a modern world we are overly exposed to the manmade. Using wood as an element creates a welcoming and calming environment, that gets us back to nature. Also, wood is timeless and versatile. It is a material that will serve you well over time. We have seen an increasing desire for lighter, airier spaces, and wood is a wonderful material to incorporate. In 2019, a combination of contrasting textures and sleek finishes is one of the defining styles. 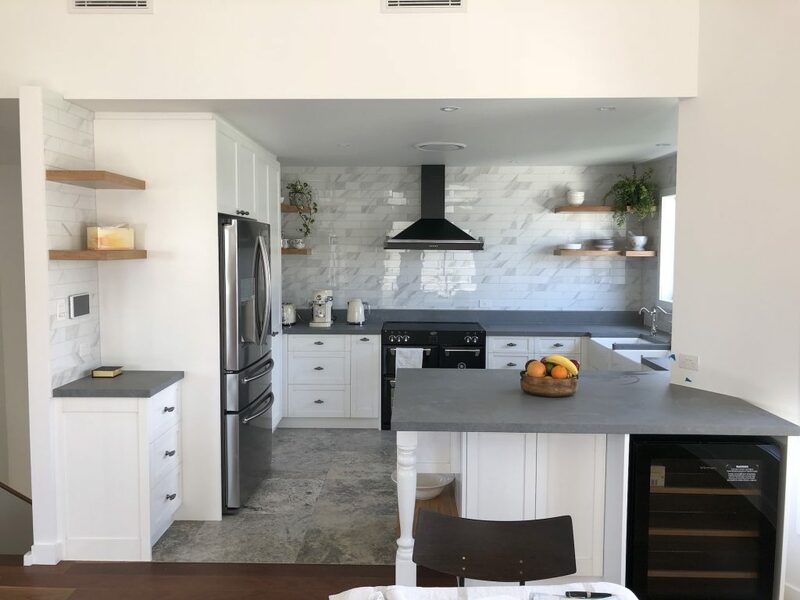 Contrast has always been important in design but there is now a more knowledgeable consumer who is seeking contrast in their kitchens more frequently. The important thing to note with contrasting textures is subtly. You don’t want to overdo contrasting textures, you want them to complement each other. 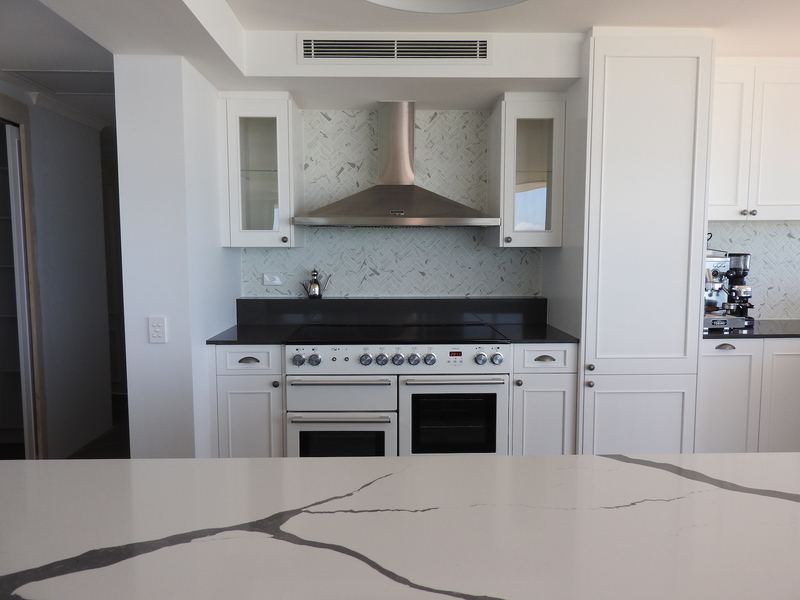 Think mirrored backsplashes with highly-polished, chunky marble work tops, or cupboards with textured bronze inlays and matte cupboard fronts with sandblasted timber for a rough aesthetic. In 2019, modern kitchen design will be about going back to basics. Kitchens are being pared down to allow raw materials to shine on their own. Think wood, stone, shiplap, and jute. This goes with both the use of wood and with the use of contrast. 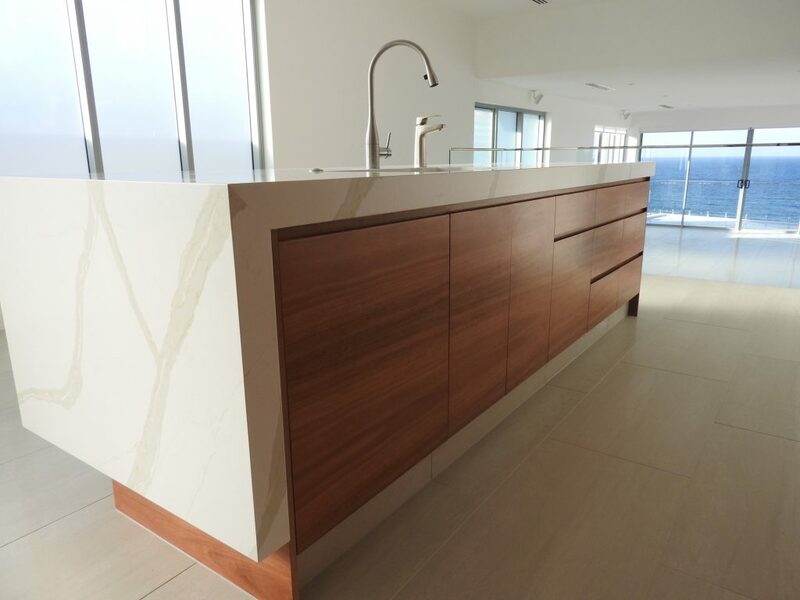 Work raw materials into specific areas of your kitchen to give a natural and worked feeling to the space. We’ll continue to see traditional elements and forms in harmony with modern design in 2019. Think honed, natural stone, organic basalt tiles, hand wrapped rattan furniture and vintage-inspired fixtures and lighting. Vintage aesthetics last, they stay in because they have been in forever. Make sure to avoid tacky materials and finishes when looking vintage and stick with the time-tested styles. We will continue to see integrated appliances dominate. There is constant innovation when it comes to appliances. Living in an age that produces so much we are used to getting different appliances every other week. Induction cooktops continue to be increasingly popular because of their seamless look. You no longer need to see appliances sticking out everywhere anymore and that’s the new face of modern kitchens. 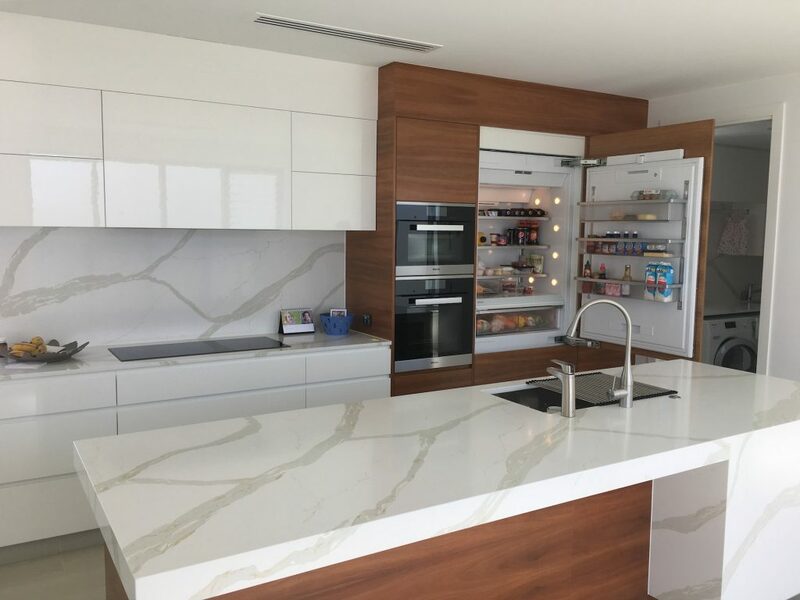 This aesthetic combined with the seamless cabinets mentioned earlier lends itself to a minimalist ideal. 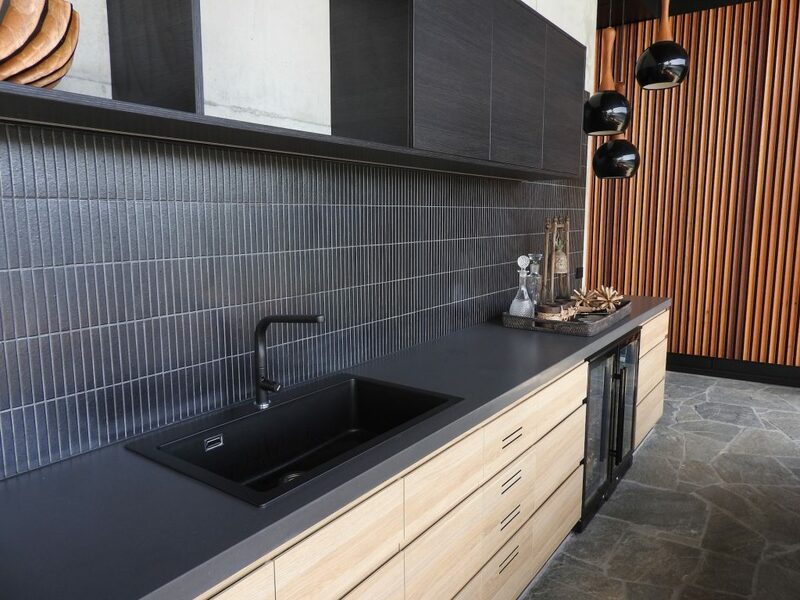 Matte black will continue to be one of the most predominant finishes for any kitchen fixtures, hardware accents, and even millwork profile details. 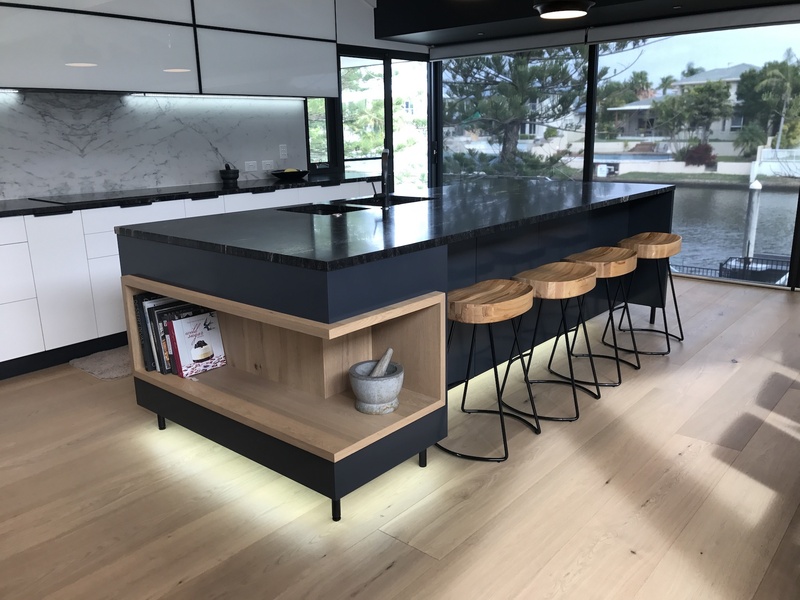 Black feels fresh as a crisp accent colour in light-coloured kitchens, and black finishes are a way to add some drama without fully darkening your kitchen. On the flip side, lighting will be distinguished by lively jewel-toned colours that bring an intimate living room quality to the otherwise utilitarian kitchen. Again, this lends itself to the overall trend towards more minimalist appeals. Whatever Kitchen trends you decide to run with this year make sure to give us a call! 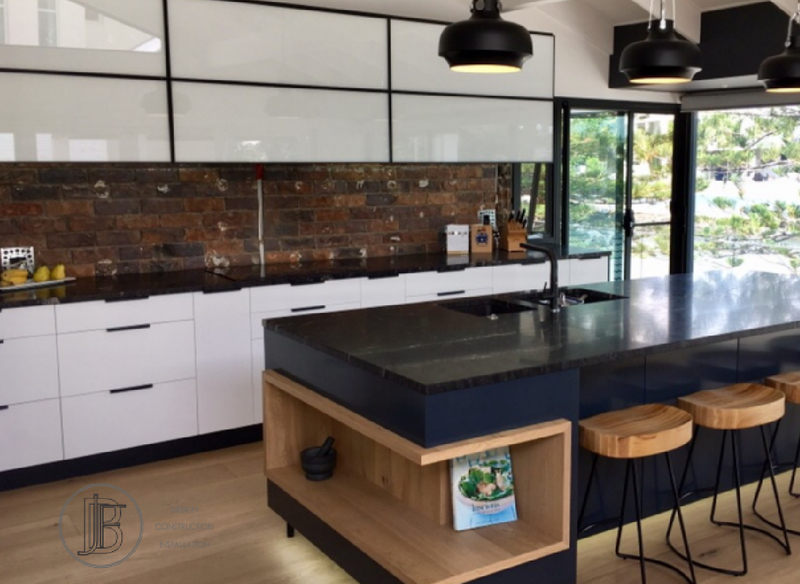 We have been creating beautiful kitchens that stand the test of time for many years across the Gold Coast. 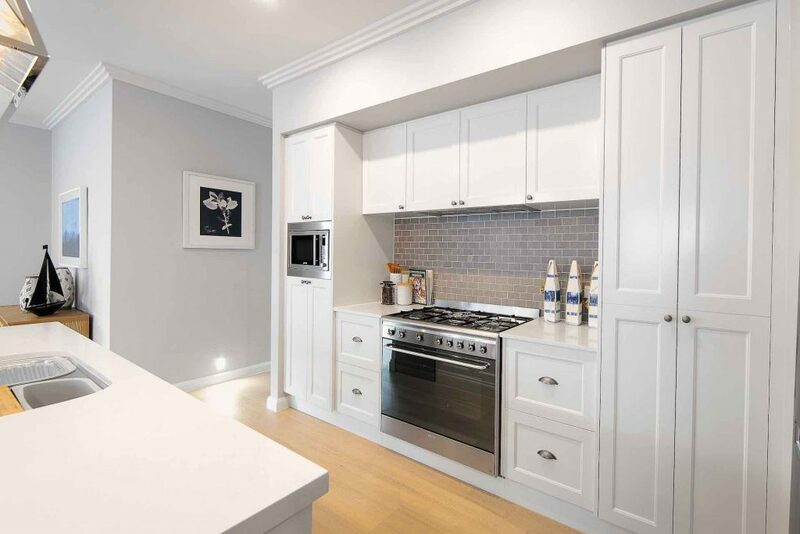 We have the expertise to help you design and build the kitchen of your dreams, get in touch with BJF online or over the phone to make an appointment.